Found 34 holiday rentals in Dubai. This 3 bedroom apartment with swimming pool is located in Dubai and sleeps 6 people. It has WiFi, parking nearby and air conditioning. 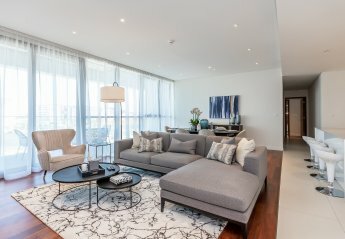 3 bedroom apartment situated on the 25th floor in Downtown Dubai offers 180m² of luxurious living space to easily accommodate up to 8 guests. 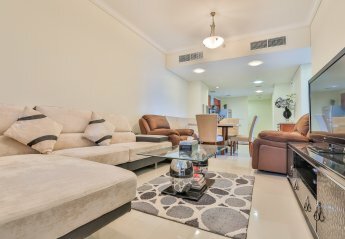 Prominently located in upscale Dubai Palm Jumeirah this short stay apartment is luxuriously furnished and among the best in way of comfort, elegance, and quality. Come and stay where deep turquoise water and white sandy beaches of Dubai awaits you. This three bedroom self-catering apartment in Palm Jumeirah Marina welcomes you to a life of luxury and comfort. This spacious serviced water front Dubai apartment offers epic sea views, gourmet kitchen, swimming pool, gym, steam and sauna rooms. We found 34 holiday rentals in Dubai.